LOUISVILLE, Ky. (AP) David Padgett’s family pictures line shelves behind his desk, where several other photos are displayed. Other personal mementos sit in open boxes along the right side of the wall in the office of the interim Louisville men’s basketball coach. Padgett hasn’t had time to completely unpack as he settles into the massive office once occupied by Rick Pitino that overlooks the Cardinals’ practice court. It has been nonstop on-the-job training for Padgett, who is trying to balance everything from crisis management amid the fallout from the national college basketball corruption scandal that still looms over the program, to coaching, leading, recruiting and oh yes, moving. Padgett has only occupied Pitino’s old office since mid-October and he has been too busy trying to maintain continuity in Louisville’s program to completely settle in. In an interview with The Associated Press, he acknowledged it has been an adjustment. ”It was awkward because I worked for (Pitino) but obviously because I played for him,” said Padgett, a three-year starter under Pitino from 2005-2008 who was an assistant on the Louisville staff last season. Padgett was promoted Sept. 29 in the wake of Louisville’s acknowledgement that it is being investigated in a federal bribery probe of college basketball . Pitino was placed on unpaid administrative leave two days earlier before being fired Oct. 16 after 16 seasons, the final step in the school’s personnel process that allowed Padgett to eventually move into the formerly locked office. As hard as Padgett is working, It is unlikely he’ll ever be really comfortable – not this season anyway. While he has yet to spend the night in his office studying an opponent, Padgett sometimes arrives before dawn to watch video while walking the treadmill. He tries to be home by 7 most nights to eat with his wife, Megan, and put sons Nolan, 4, and 19-month-old Gavin to bed. 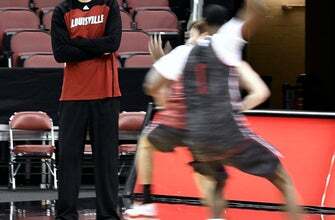 Padgett’s biggest challenge might be honing his sideline demeanor. He looks uneasy sitting on the bench but can’t stand within the coach’s box for 40 minutes, either. At times Padgett has squatted, or even taken a knee – trying to find his comfort zone. Fortunately for Padgett, a vast support group of coaches, ex-teammates, family and friends are available to provide advice – the same group that convinced him he could handle the biggest challenge of his career. Whether Padgett’s stay extends beyond this season depends on how well he guides Louisville through the cloud of a second scandal in three seasons and if the Cardinals go deep into the postseason under his leadership. That is a tall order for the 6-foot-11 Padgett. That Cardinals players urged school officials to name Padgett as Pitino’s successor spoke volumes about his standing within the program. Rogers agreed that Padgett was the logical choice and echoed the sentiment that his even-keeled temperament – a digression from the fiery Pitino – was critical to maintaining stability. Just don’t mistake Padgett’s calm for meekness. The coach’s booming bass voice has been noticeably louder in recent weeks as the Cardinals (10-2) have struggled against non-conference opponents. Padgett can appear intimidating, and he even broke part of a video sign board after slamming his hand against it in frustration. Padgett has done a solid job early on and Louisville is riding a six-game winning streak heading into Friday’s annual rivalry matchup at No. 16 Kentucky (9-2) . While the Cardinals still have a ways to go, they’ve shown flashes of the intense defense that was a trademark under Pitino. ”We’re trying to do a lot of what’s been successful here and especially from a defensive standpoint,” Padgett said. ”Offensively, we’ve changed some things but I just want these guys to be confident and play loose and just feel like they have the freedom to play basketball. Padgett has tried not to overthink his new role, though focus is apparent in his daily routine. There are still constant reminders of Pitino and his success visible throughout the Cardinals’ practice facility. A mural featuring Pitino hoisting the 2013 NCAA championship trophy lines the outside wall of Padgett’s office, and there are pictures lining walls throughout along with numerous trophies. And that’s OK with Padgett. ”It reminds you,” Padgett said, ”but it’s not a situation where I’d say let’s tear down everything and not be reminded of coach Pitino because he was extremely instrumental and had a big influence in my playing and coaching careers. Accentuating past success without focusing on previous missteps probably sounds pretty good to Louisville.